← Weeds are flowers too, once you get to know them. The following is an updated version of how I made the Cannabis oil that successfully cured my breast cancer. I’ve applied many of the useful tips and suggestions posted on the original blog for an even healthier more potent oil. Please note that the following is just a guideline of how I made it and should not be considered the only way to do it–this is simply meant to help those who are willing to help themselves by providing a step by step “recipe” that you can print out and use while you cook. Firstly, when making it yourself you can check that the quality is up to scratch, that it has been made correctly and of course, it is much cheaper when you don’t have to pay someone else to take all the risk. If you are looking to buy it you are going to pay anything between R3000 and R5000 for 10 ml and for a full cancer treatment you are looking at needing at least 60 ml over a four month period. Whereas if you make it yourself you are probably not going to have to pay more than R2000 for the whole lot and this should make you 60 ml. So if money is an issue – make the oil yourself! There are also unscrupulous people who see this oil as a way of making money and so they mass produce the oil, not always taking the necessary care to ensure it has been made correctly with the best plant material available. In this case ask around and see if anyone knows about the oil – there are more people on this oil than you might realise – and see if they can’t recommend someone who sells the oil. And, as with all things illegal, be discreet, be savvy and be safe – always. The better quality plant you use the better quality and quantity of oil you will be able to get but don’t feel you need to go for the super expensive indoor’s and indica’s. Indica plants are all the rage at the moment for smokers because the relaxation aspect is so intense. However, Sativa’s, which are the natural African strain, are extremely underrated. Swazi, the variety I used, is a pure Sativa. Sativa’s have a higher CBD to THC ratio. CBD’s have been attributed with providing the anti-inflammatory and pain-relieving properties as well as repairing nerve damage. It also provides a mental high, improving brain function and stimulating thoughts and creativity- this is why it helps with depression which is especially beneficial to those experiencing a illness like cancer – basically it helps to get you feeling optimistic and empowered and as your depression subsides so you are able to take more and more empowering steps in your daily life to assist in your recovery. I used an outdoor Swazi variety – a strain grown in Swaziland. This is a lovely, uplifting African Sativa and easily available in KwaZulu- Natal. Other African Sativa varieties available are from the Transkei and Lesthoto. It’s important to ask about where the plant was grown as impurities in the soil and ground water (IE: on a mine dump) are absorbed by the plant and can contaminate your oil. Of course, the only way to be completely sure is to grow the plants yourself. I also found that when I used what is known as “crush” (the leftovers at the bottom of the bag) it was cheaper and yielded lots more oil, so don’t be scared to ask for this. Most people don’t have a network set up to provide them with the amount of plant matter required to make a decent amount of oil. In this case it’s helpful to talk to Rastafarians in your community. I have always found these gentlemen to be amazingly kind and helpful in sourcing the plant matter – especially when you tell them what it’s for. I bought “5 L” of outdoor Swazi – a 5 L is how they measure out the cannabis; they use a 5 L ice-cream container to measure out the weed and put it into separate bags. It averages out to about 500 gm but it’s far from an exact measurement. A 5 L container could yield anything between 30 ml to 60 ml depending on the quality of the plant. NOTE: Outdoor cannabis is generally harvested from about May. So, it’s cheaper and easier to get hold of it from May until November and then it becomes very hard. It’s better to buy in bulk when it’s available and make as much oil as you can so you don’t have to worry about a shortage. Originally I bought rubbing alcohol (91%) from Dis-Chem Pharmacy but this can leave a poisonous residue in the oil so I changed to using 99% Isopropyl alcohol. You can easily locate this online – check online for chemical lab supply shops in your area, the alcohol is cheap and clean and easy to buy in bulk. I strongly recommend using isopropyl over other solvents as isopropyl is one of the only ones which can pull out the chlorophyll from plants and cannabis is one of the richest sources of chlorophyll. This is important when you think of the first thing you are told when you look into alternative methods of healing cancer – eat more green leafy vegetables! This is because the green in the plants (the chlorophyll) gives your body what it needs to sort out a whole host of ailments. Rick Simpson advocates using Benzene, which doesn’t draw out the chlorophyll and gives no explanation for why he prefers it without the chlorophyll. However, from all my research and my own experience, the chlorophyll is not to be underestimated in the healing process. So, in this method, I differ from Rick Simpson because I believe the more chlorophyll the better. It’s also important to bear in mind that when using isopropyl you don’t add water to the mix – you ONLY do that with Benzene. I bought 6 L of alcohol for 500 gm of weed. Don’t worry about anyone getting too suspicious about you buying that amount of isopropyl alcohol – fortunately it’s used for lots of legal stuff too! Important: Surgical spirits and Wintergreen are not the same as isopropyl alcohol – don’t make that mistake! Step 1: First I pulled all the big stalks off the plant and threw those away. However, if you are going to use a coffee grinder (which I highly recommend!) then this is not strictly necessary. Step 2: Grind the plant matter up in a coffee grinder. If you don’t have a coffee grinder, use scissors and cut the plant up as finely as you can. The plant is very resinous so you have to put small amounts into the coffee grinder and use a teaspoon to help scrape it out. Once you are finished, wash the coffee grinder out with some alcohol to dissolve any of the resin and pour this in with the plant matter. The reason you grind it is to allow a smaller surface area for the alcohol to penetrate into the plant, therefore allowing it to draw far more from the plant. Step 3: I soaked the plant matter in alcohol for two days (at least) – it allows the alcohol time to saturate the plant and to pull out as much oil as it can. Make sure you don’t use up all your alcohol; you’ll need to keep 500 ml to clean up after yourself. Step 4: I then strained the alcohol and plant matter through a thick stocking into a large pot. This is another reason why using a coffee grinder is handy as it means you don’t have any sharp stalks making holes in your stocking. Step 5: After this I then strain the solution through a coffee filter. It is not strictly necessary to do this step. By straining the oil you take out any fine plant matter and pollen that may be left in the oil and so the oil is further concentrated. The leftover plant matter and pollen doesn’t seem to be harmful and it bulks the oil up, making it thicker which makes it a bit more forgiving when it comes to measuring out the dose. The more you strain it, the runnier it gets and the more concentrated which means you need to be much more careful with the dosage – especially with old folk, as too much oil can make you feel woozy and unbalanced on your feet. Also, if it’s too runny you need to be more careful it doesn’t leak out your syringe. How much you choose to strain it is up to you. Step 6: I double-boiled the oil in water in an electric frying pan –like melting chocolate. This way I could ensure the temperature stayed around the 100 C mark and didn’t overheat it and destroy any of the THC or cannabinoids. Remember, the higher the temperature, the more the oil degrades – so lower for longer is best. The smell is quite overpowering – mostly from the alcohol fumes, so I made sure I had good ventilation where I was cooking and had incense handy for the neighbours’ benefit! It doesn’t smell like weed, it mostly smells of alcohol but the point is that it is smelly. It took all day and I had to keep an eye on it so that the level of the water in the double-boil didn’t drop too low. Step 7: When the level of the oil got really low, I moved it to a smaller pot and used some of the spare alcohol to wash the big pot out. I poured this alcohol into the little pot too. I then boiled the alcohol down until it became thick and the smell changed to less of the alcohol and the more peppery smell of the oil. The smaller also lessen and become isolated little groupings. I reduced the heat and and continued to cook it on low for another half hour to be sure all the alcohol was boiled off. The oil should be thick and tacky when it cools. Step 8: I allowed it to cool to check that all the alcohol had been boiled off and once it had cooled down the look and consistency resembled Marmite. Sometimes when the plant matter is still a bit green it leaves water behind in the oil. When this happened, all I did was wait for the oil to cool and then I would pierce the cold oil with a knife and gently poured the liquid out – I made the mistake of leaving it in once and it was revolting! Step 9: After this I re-heated the oil and once warm I sucked it up into syringes and then plugged the syringe with wax by pushing the nib into a candle. (To undo this I simply dipped the nib of the syringe into hot water and then very gently pushed the wax out). Step 10: I mixed the left over oil in the pot with heated olive oil; the olive oil picked up the cannabis oil and I used it in my home-made body balm which I applied directly to the affected area- I could also have used it in food if I wanted to. I kept my open syringe in a mug in the fridge and it lasted forever. 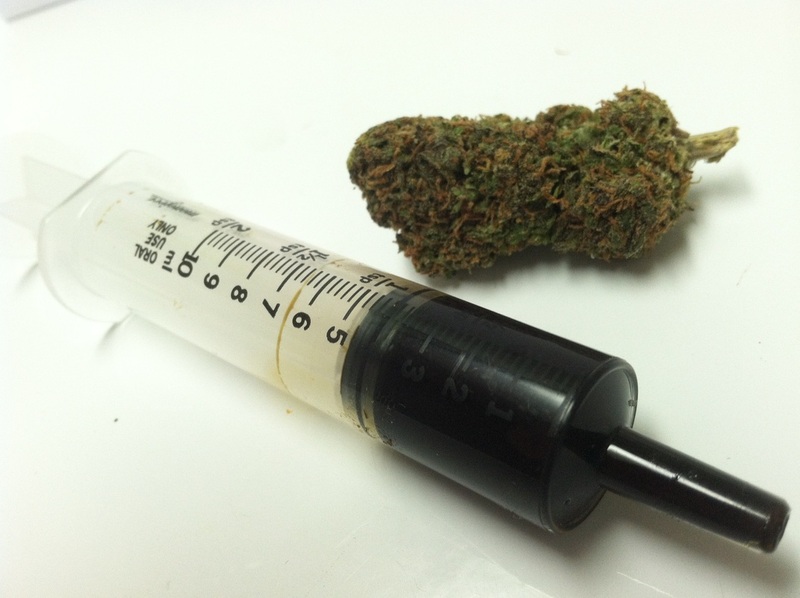 I found the oil would leak out of the syringe and made a bit of a mess but in the mug it remained contained and when I was finished with the syringe I used olive oil to pick up the cannabis oil at the bottom of the mug – waste not want not! And that’s it, really easy and amazingly effective –enjoy! great instructions!…..was always curious on the whole chlorophyll thing….seems like more people then not figures in not soaking the bud that long to avoid all the plant matter but we know chlorophyll is high alkaline and should be part of the oil….kind of wonder how many of these producers actually know what they are doing.. I love you for openly posting this. Such an inspiration and I’m learning the community that’s looking into these means are far greater than expected. I pray for the Medical Innovation Bill to be legalised and for Ambrosini’s work to be recognised. Swazi is generally a Sativa dominant strain which holds great levels of THC. This is great for curing cancer but it requires an amount of CBD proportionally to effectively combat these mutogenic cells. Luckily our plants have been cross bred with Indica strains brought over from European countries since the 80’s. This was done to minimize growth time and thus resulting in greater profits. However this also is good for us as Indica dominant strains posses higher amounts of CBD. Its very difficult to find a pure Sativa strain any more due to cross breeding and any “outdoor” should be perfect for treatment. Thank you for your wonderful input – very interesting and beneficial! It’s best to use mostly flower buds and some leaves if you can get your hands on them. Please advise, i dont understand the water part when boiling. Do i add water or dont I .
Hi – DON’T ADD WATER! We use a different solvent to Rick Simpson – using isopropyl alcohol and not naphtha so you don’t add any water. Unless you are using 100% isopropyl alcohol there will already be some left over water- if it’s 99% isopropyl then at least 1% is water- so you have already added water to the mix when using the isopropyl alcohol. Also, if you have managed to boil off excess water you have added (which is not easy as the water gets trapped under the oil and doesn’t just boil off- I’ve had to use a hair dryer in the past to help evaporate the water from under the oil) – once the water is boiled off, any ‘residue’ from that water will be left behind, it wont have evaporated with the water (think of salt water- if you evaporate all the water you will still be left with the salt) from my own experience, adding water only adds to how much work you have to do and doesn’t provide any benefits. If you are concerned about residue being left in the oil then try find 100% isopropyl as all of the alcohol will evaporate or perhaps you should consider using another solvent? There is an excellent olive oil method in the comments section here or there is the coconut oil method which Im happy to email to you – let me know! Great blog! Your method is in line with best practices. One thing I do recommend is to properly dry your buds straight after harvest by hanging them in a dark cupboard for 10 to 14 days. You will know it’s ready when the stalk snaps like a twig instead of just bending. Levels of THC and CBD are greatly increased when the buds are properly dried. One would think that “wet” plants would have the greater content of THC. How sure are you about drying them out first as I do not want to waste the plants ? THC would increase as a result of decarboxylation which would happens when you heat the plant. Drying the wet plant in the oven for a bit would also achieve decarboxylation. Hi kellzzy, Congratulations! I’m so glad you are cured of breast cancer. Thanks for this excellent article. I have been making the oil for about 2 years now and my current method is almost identical to yours. My oil has cured 2 cancers and a few other ailments as well and I give away my oil for free (as we all should). Just one tip: I use a plastic straw to close the end of the syringe. Cut off about 2 to3 cm of the straw. Pinch one end flat and seal it using a lighter. The open end fits snugly over the end of the syringe. Thank you so much for that excellent tip! Also, well done for making the oil yourself and for helping people in such an amazing way – the world is changing for the better because of people like you. Hi – I have contacts I can share with you. I will send the details to you via email. Hi Grum, my daughter has terrible pain from fibromyalgia and I have heard that this will help. I do not want to take on the tricky task of making my own oil. Do you sell to people in Cape Town? I have found a supplier but it is very expensive. Has anyone tried to make the oil using the Magic Butter machine? And will this remedy also help for Rheumatoid Arthritis? Can you use a “slow cooker” or “rice cooker” instead of cooking on a element stove ? I am just concerned about the dangers of the flammable fumes etc. I am looking at producing this oil for a friend of mine who has been diagnosed with cancer. I will gladly produce extra for anyone else who needs it. I could also set up “hydroponics” to grow a decent strain where I live as I have enough space. I’m not sure about the slow cooker as I don’t have any experience with that but in the Rick Simpson movie, Run from the Cure, he uses a rice cooker, so I’m sure that’s fine. Kellzsy, I have made the oil using the Magical Butter machine, which grinds and heats and extracts the oil from the plant material. Then I just needed to boil off the alcohol to produce the oil. First dosage was taken by a friend who has advanced cancer of the cervix. Hoping it helps…. Excellent – thank you for sharing! I want to make some oil for my girlfriend, She is a type 1 Diabetic and had it since the age of 6, she is now 29. Thanx again for sharing your knowledge! I get it from a place in Durban called Laboratory and analytical Supplies and their number is: 031 3060899. You could call and see if they can help? Alternatively, go to your pharmacy and ask if they have any in the back. Not all pharmacies keep it and not in large amounts and it’s also more expensive but better than nothing. They use it to clean equipment, etc. Your oil turns into a type of marmite paste and I have seen oils that are in fact “oil” and sold / distributed in capsules. How can I produce this type of “oil” and not the paste version ? Thanks for the question. I recall seeing that oil made with naphtha results in a golden coloured oil. However, naphtha is not the safest solvent to use and studies show that although it results in a high THC content, it is very low in terpenes. It’s also golden in colour because it doesn’t pull out any chlorophyll from the plant. Cannabis is one of the most chlorophyll rich plants on the planet and I see it as a large disadvantage to exclude it from the end result. However, more and more people are moving to using either olive or coconut oil as a solvent with great results. The benefit to this method is that both these oils are easy to use and safe for human consumption. It’s also been shown that coconut oil helps enhance the body’s ability to absorb the oil more effectively. Hi, yes – the alcohol is not safe for internal consumption which is why it’s important to boil ALL the alcohol off. Your solvents are good – so go ahead, but when you get near the end, pay attention to the type and size of bubbles – when they change from lots of little bubbles to fewer, larger bubbles, you know the alcohol is burnt off – however, I always boil it for a little extra to be super safe. hi Kelly. thank you so much. its been so hard to do this with all the american versions etc. i am grateful to people like you. my brother in law has just been diagnosed with lymphoma and it is not looking good at all. i unfortunately cant afford a 5lt tube, so i am getting a smaller quantity. i am going to try this and i hope i can help him. i really want to buy it instead but i dont know where to go and already it is more costly. thanks so very much for everything you are doing on this thread and for responding, it is people like you that make a real difference. i dont even care about getting into trouble for this. if i do, it would be for something i believe in. It’s a real pleasure, especially when people are brave enough to do it themselves – and hearing the positive stories always makes it worth while. You can make it in smaller quantities: 100gm of weed roughly works out as 10ml of oil. Let me know if you need help or unsure of anything! Thank you so much for the how-to-guide on making this great oil, much appreciated! One important question I have though regarding the process. You mentioned that you generally use Isoprophyl alcohol as a solvent and as a result you do NOT add water to the mix (plant & solvent). Will gladly appreciate your response on this. Hi – good question!The method of double-boiling is when you get a larger pot and put water in this and then put a smaller pot inside this larger pot. You take the pot with the solvent in and put this smaller pot into the bigger pot of water – no water goes into the solvent. The smaller pot sits inside the larger pot which has the boiling water. The water boiling on the outside of the smaller pot helps to regulate the temperature of the solvent and keeps it from over heating. You still never add water to the solvent – the water is only in the bigger pot to regulate the temperature of the smaller pot. Hi Kelly…Ok I see now. Thanks for the clarification, much appreciated. Tnks for sharing your story and for hope reinforced. Pls could you cintact me via email so that we can exchange phone contacts. I need help for my mother who was diagnosed with cancer of the lungs last year…very disheartening. Sorry – no idea. The above method doesn’t require a magical butter machine. Were can you find the seed to grow it youself. Does it grow outside during anytime of the year? How long does it takes to grow. Do you the use the whole plant above the ground? There are some local sites online that sell the seeds and I have friends who have successfully bought seeds this way. It grows all years round but the best time to plant is in April/May as that is when the natural harvest happens, which is when the plant would be naturally scattering it’s seed. Outside is great, but in winter growth takes longer. Be sure to give your plants plenty of sunshine, nutritious soil and healthy water. You can use pretty much the whole plant but the stem can be thick so it’s easiest to just use the leaves and buds. I thought you planted in September and then harvested in April / May ??? September is fine – just in time for the rains! Anytime from September to December is a good time – they will be sprouting anytime from now. It sounds real interesting and kinda easy to make. When starting off, must the plant be wet or dried out? It doesn’t matter if the plant is wet or dry – some claim it’s better when the plant is wet, while others claim drying it first is beneficial. I find if the plant is wet I do need to soak it for longer. Alos, wet plants release water into the oil which you might have to drain off near the end – this doesn’t happen with the dried plant. Firstly I would like to say Kudos and Thank You you for helping people and giving them hope with this oil that “Big Pharma” obviously doesn’t want us to know about or start making on our own. Thank you for taking the time to educate people and may God bless you. I have a 5 year old autistic child who for most part of the day screams, cries and throws tantrums. He is non verbal and also still in nappies. Sleep is also an issue for the child and an average of 3-4 hours a night is the norm. The rest of night is spent roaming the house in the dark, rattling cupboards, etc. I was given a few ml of oil by a friend not too long ago and decided to give it a try with my child. I gave him about 0.2ml in the afternoon and for the first time my child slept throughout the night. We were amazed and also relieved. Going forward I would like hopefully stop the medication he is currently on as it has terrible long term side effects, is expensive and is not helping anyway. 1. I currently have 85% isopropyl alcohol that was purchased from a chemical company. Would it be ok to use this as a last resort? 2. I have seen a few videos where pure coconut oil is added after then reheated again for a short period to supposedly make it stronger? What is your experience with this and would you recommend it? 3. Would you also recommend decarboxylating the plant material before hand? 4. Would you please share your safety tips with us as solvents are flammable and we would like to be as safe as possible? Firstly, well done for being brave enough to try the oil. I’m not surprised to hear that your boy slept well – it helps everyone. Also, don’t underestimate the healing benefits of a good night’s sleep (for all of you) but especially for your son. The oil helps to bring you into a deeper state of sleep that allows our body and minds to process and heal more effectively. Keep his dose small and increase it only gradually – as he is so little, you might want to mix the oil into coconut oil first to dilute it and make it easier for dosing. 1. 85% Isopropyl is not ideal as I’m not sure what’s in the other 15% that might be left in the oil. If you are struggling to find the alcohol rather use the coconut oil method – I will email you the recipe. If you did use it you would also have to soak your plant material for longer as the alcohol to draw it out is not as strong. 2/3 Re-heating the oil in the coconut oil to make it stronger will probably be to further decarboxylate it to increase the THC. From my experience you only want a higher THC content when you are fighting cancer – for everything else (including neuron and brain repair) you want a higher CBD count. CBD’s are destroyed at a higher heat which is why I make my oil using the double boil method to keep the temperature constant and not too hot. THC also makes you feel more ‘high’ whereas the CBD’s make you feel more relaxed and sleepy – which I think would be more beneficial for your son. 4. Make sure you are in a well ventilated area – preferably outside or on a balcony/veranda. I use an extension cord and an electric frying pan and do it outside. The smell is not like smoking it – it smells more like the alcohol than anything else so you don’t need to worry about the neighbors catching a whiff. Although it is flammable, if you have good ventilation it’s fine but don’t light matches, smoke, etc around it. I wouldn’t recommend doing it inside as the fumes are pretty strong and you can start feeling light headed and a bit ill if you have to breathe it in too much. Thank you Kelly so much for imparting you invaluable advice and experience with us all. 1. I did find out from my supplier about the other 15% and I was told that it is water. If it’s just water, that’s ok – you might need to boil the water off or even ‘drain’ it if it’s still left over. I found with fresh plant material that water would often remain at the end of the process. The best way to circumvent this in my experience is to let the oil cool down and then poke a hole in it and literally pour the water out (it gets trapped under the cold oil) Well done for finding out about the alcohol! May you please send me an email,I’d appreciate your advice on this matter. Thank you very much for sharing this with the entire world. Anyway I want to know if that is done using fresh green or dry cannabis leaves or whatever? Thank you Itayi – I’m happy this has been helpful for you! You can use either green or dried plant matter, just bear in mind that the green plant material releases water into the oil which will need to be drained off at the end. My wife has been diagnosed cancer,where can I get ready oil? I will in box you. If you could email me as well, looking for a reasonably priced and quality supplier in Cape Town. I am interested in using this as a homeopathic product for myself. Where could I buy the authentic product and what would the costs be? My husband has been diagnosed with prostate cancer. I also know a friend with stage 4 colon cancer. I intend to make the oil myself however I would like to know where to fined the oil and how/how often to administer the oil. For your husband there are two ways he can take it. 1. Orally – he would start with a grain of rice sized dose of oil just before bed. He would double this every Friday night (it leaves you feeling heavy and drowsy in the morning when you first take it so it’s best to increase your dose on a night when you can sleep in the next day). He would increase this dose to about 3-4 rice grain sized dose. It might take him longer than 4 weeks to achieve this – every one has different tolerance levels and he should adjust his dosage to suit him. 2. Suppository- (this method is extremely effective for prostrate cancer) You mix the oil with coconut oil in small round molds (you can use a chocolate mold with the right shape). Put the mold in the fridge to get hard. Once it’s hard, simply insert it and when the coconut melts the oil will be absorbed. The benefits of this method is that you don’t get affected by the ‘high’ as much which means you can start with a larger dose and it is going directly to the affected area which helps speed up healing. I’ve included a link below that covers different dosage methods but more importantly it gives you some information on side-effects, etc. 3. Cut out all sugar, processed carbs, alcohol and caffeine. (one glass of whiskey and water a night if he really wants to drink). 4. Use coconut oil for all cooking. Just not sure what you meant by “double boil”. Could you explain what you meant please? Hi David – ‘double boil’ consists of a bowl placed on top of a pan of simmering water. The bowl does not touch the water, but creates a seal with the bottom pan to trap the steam produced by the simmering water. The trapped steam keeps the top bowl going at just about 100C, the temperature at which water turns to steam and a far lower temperature than could be achieved by putting the bowl directly on that burner. Great resource Kelly. This is similar to how I make my oil, though I use a induction cooker so that I can set the temp to 80 degrees while I boil off the solvent and then give it a final boost just above 100 degrees at the end to make sure all the solvent is evaporated. Thanks so much for the input! I had a look at your blog and it’s a great resource – I will be sharing the link! Thank you! Hi Kelly, I see that you answered Annon with a similar question regarding making “oil” as opposed to “paste”, that they should use olive oil or coconut oil as solvent. This is not alcohol based. How does it strip the chlorophyll and terpines etc from the plant. What is the method please. Hi Leonie – my understanding is that the alcohol method strips everything out the plant -which is why I still recommend it (so long as it’s made correctly and all alcohol is boiled out). The coconut oil method doesn’t seem to pull out as much chlorophyll as the alcohol method but there is some. I don’t know if it pulls out any terpenes – I will have to do some research! However, for people who are nervous about using the alcohol method, this is a safer way to go. Also, it’s a lot easier to get your hands on coconut/olive oil than it is to get ispoporopyl alcohol or ethanol. Personally, I prefer making the oil using the alcohol method and then later mixing it into coconut oil – that way I still get the benefit of ‘whole plant extract’ but it’s diluted with the coconut oil so it’s easier to manage the dosage. Thank you Kelly. I want all the benefits of the plant so will do as you say with diluting in coconut oil. What do you do about the solidifying of the coconut oil in the winter months. Where can I find step by step instruction on the decarboxylating process. When you make your oil, do you first decarboxylate the plant, before soaking it in the solvent? How necessary is this step? Thank you for this..I need to start making oil. Thanks for all the great info and great work! I have a question regarding using a slow cooker . I purchased one at checkers and made the oil. However the isopropyl never boiled at all during the process but all the liquid evaporated in about 2 hours . I was left with some good oil but im not sure when is the right time to start pulling the oil with a syringe as there are no bubbles but alot of black sticky toffee like substance all over the base of the slow cooker? Any help would be grateful. Well done! The slow cooker is an excellent way of making the oil. How I test for left over alcohol is while it’s still heated and liquid – if there are clear streaks in the oil when you pour it from one side of the pot to the other, it means there is still alcohol. When all the alcohol is off the oil is very thick and dark. Once it cools it should be very tacky – almost solid. Hello thank you for this wonderfully informative article – I am keen to try cannabis oilfor my awful menstrual migraines. Do you think it would work and what dosage would you suggest ? Hi Kelly,I’m relieved to hear you’re cancer free and I wish for every person who has cancer to also overcome this dreaded disease.Is there maybe a way I can contact you regarding the oil please.I was diagnosed with Stage 4 melanoma last year september and I’m supposed to start with Interferon chemotherapy but I’ve heard scary stories about chemo.I would really like to use your oil instead.I’m from Rustenburg,North West.Is there any way I can get in contact with you please.I will appreciate your help alot.Thank you. I have been curing my plant matter for about a month (After I dried it) so it’s not snap dry but it is dry. Your thoughts on the isopropyl / food ethanol debate Kelly ???? Firstly, I think it’s awesome that you are growing and making your own oil! Secondly, With regards to the ethanol/isopropyl debate I feel that if you can afford it you should definitely go with the ethanol. Iso is cheaper and therefore more accessible for people but with both the Iso and ethanol I have to emphasize the need to completely boil off the solvent. Even when you think it’s done, let it go for ten more minutes to be safe. Ethanol (food grade!) is preferable but I live where they grow the sugarcane that makes the ethanol and I see the planes and microlights regularly spraying the cane fields with pesticides. I’m not sure how much of those chemicals end up in the ethanol but it makes me nervous which is why even if you are using ethanol, you really need to be sure all the solvent has been boiled off. I am a total novice but want to make my own oil.The processes I am happy with – I have a more basic qiuestion.Where do I get the plants to make the ouil if I do not grow it myself.I do not know where to start.I live in Pretoria. Hi Peter – send me a mail and I’ll send you contact details for someone who can help you. Pieter, If you had to buy a good quality strain of cannabis it is going to cost you a fortune. You need to find good seeds and grow your own otherwise it will just be cheaper to buy the oil from a reputable source. Pingback: Tudo que você precisa saber antes de dizer não para a Maconha Medicinal | Vida, sua fanfarrona!! !